Olentangy Liberty’s Aidan Kenley (14) finds some running room in the first half of Friday’s non-league battle against visiting Marysville. 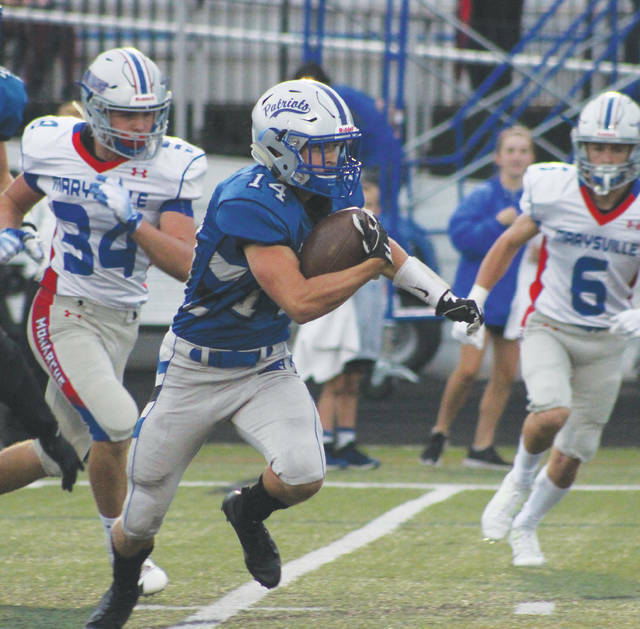 Ryan Bird’s 26-yard field goal on the first play of the fourth quarter gave the Olentangy Liberty football team a lead it never relinquished en route to a 23-14 non-league win over visiting Marysville Friday in Powell. Mitchell Okuley found Kyle Wilson for a 39-yard touchdown connection in the final minutes to add a little insurance. Okuley, in his first action since getting injured in the first quarter of the opener, finished 7-for-23 for 156 yards and the score. Aidan Kenley, meanwhile, had 63 yards on 18 carries to go with a touchdown on the ground for the Patriots (1-2). Luke Jackson ran for 82 yards and three touchdowns as the Pacers used a big third quarter to roll to a non-league win over the host Cougars Friday in Galloway. Hayes (3-0) owned a slim 9-7 lead at halftime, but grabbed control in a hurry. After the Pacer defense set up a short field, Jahi Broussard-Nash turned the turnover into points with a 53-yard touchdown run with 10:44 left in the third. Hayes picked up the ensuing kickoff after Westland failed to cover it and Jackson made it 23-7 with a 19-yard scoring scamper. His third and final score — a 12-yard TD run with 2:58 left in the fourth — smoothed out the scoring summary. The Bears finally got going in the fourth, scoring a pair of touchdowns, but the damage was already done as the visiting Titans rolled to a non-league win Friday night. St. John’s quarterback Braydon Lichtenberg completed 25 of his 32 passes for 274 yards and five touchdowns, all in the first half. Berlin (1-2) scored its first points when quarterback Jacob Moeller found Liam McGreevey for a seven-yard TD with with 7:49 left in the game. The Bears smoothed out the scoring summary when Johnny Spinner powered into the end zone from five yards out with 11 ticks left on the clock. The ensuing two-point conversion — a pass from Moeller to Justin Rader — was good. Grant Owens hooked up with Andre Ash for a 49-yard scoring strike — a play which gave the Barons (0-3) a 10-7 lead with 1:06 left in the third quarter — but the host Yellow Jackets used a pair of fourth-quarter scores to rally for a non-league win Friday night. Ashton Fisher scored all three Mount Vernon touchdowns, the first a 90-yarder with 5:15 left in the opening quarter. BV’s Felipe Scharffhad a 30-yard field goal in the setback. Michael Lowery threw for six touchdowns, four to Chris Scott, and the Panthers rolled to a non-league win over the visiting Pioneers (1-2) Friday in Pickerington. Orange’s lone score provided the final points of the game as Jake Vanchieri plowed into the end zone from three yards out with 7:17 to play. Kellen Sargent added the PAT to cap the scoring. Mark Roberts led the Pioneer offense with 92 yards rushing on 15 attempts. Orange outgained North 180-117 on the ground, but couldn’t get much going through the air as Robbie Dayhuff completed just 5 of his 15 passes for 30 yards. Also: Dublin Scioto 28, Big Walnut 26.